Package Quantity: 1 | Size: 1.9 Quart Keep fruits and vegetables last longer with the Fresh Fruit and Veggie Keeperfrom Progressive International, which helps them stay fresh for up to 2 weeks.The special design lets you wash and store all in one since the containerdoubles as a colander. A water reservoir in the base keeps produce moist, andadjustable venting regulates air circulation and moisture. This smaller-sized produce saver fits perfectly in the refrigerator on theshelf or door yet still holds bunches of carrots, radishes, grapes, greenbeans, or cherries. It's also great for saving small amounts of salad greens.A printed produce storage guide can also be found on the front for easyreference. 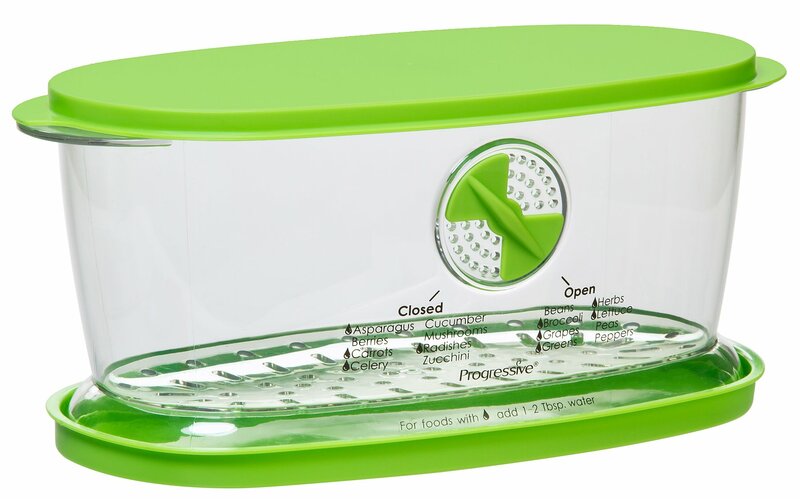 Cleanup is easy since the Fruit and Veggie Keeper is dishwashersafe. The lettuce keeper has a 1.9-quart (7-1/2-cup) capacity, and it measures6 by 10 by 4-1/2 inches. Ideal environment for fresh fruits and vegetables. Produce storage guide printed. Also great for salad greens. About Progressive International After 38 years in business, Progressive International is still dedicated tocreating functional gadgets, tools, food-prep items and household products tomake your cooking and meal preparation more efficient and fun. Located inKent, Washington, Progressive's products are sold in the United States,Canada, Europe, South America, and other international markets. Progressive Makes Cooking Cool More than a workspace, the contemporary kitchen is the heart of the home wherewe connect with family and friends, and Progressive's philosophy of productdesign aims to create the perfect balance of form, function and value for yourkitchen. The design process pulls from many different research methods such asethnographic research, consumer testing, surveys, and in-home observations,identifying real life problems in the kitchen that translate to fresh, newideas for smarter products.